Lynchburg-Clay’s Paige Flowers and McClain’s Jorden Rose battle for position and the ball along the sideline on Tuesday at McClain High School where the Lady Tigers hosted the Lady Mustangs. 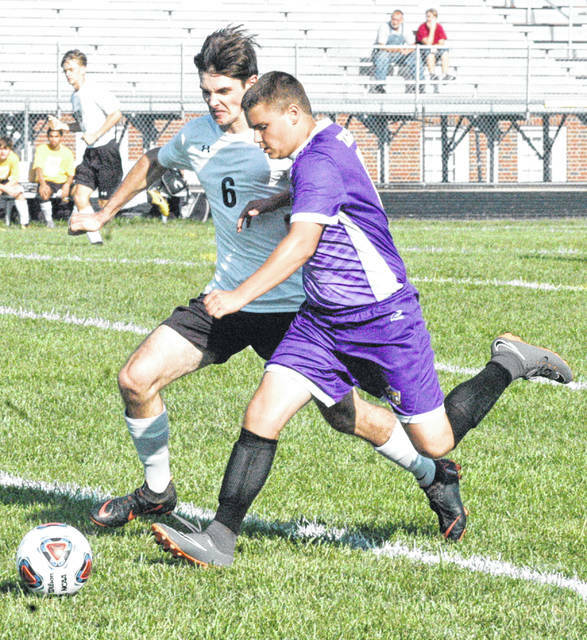 McClain’s Braden Bergstrom and Lynchburg-Clay’s Gavin Frazier battle for position in Tuesday at McClain High School where the Tigers hosted the Mustangs in cross-county soccer action. 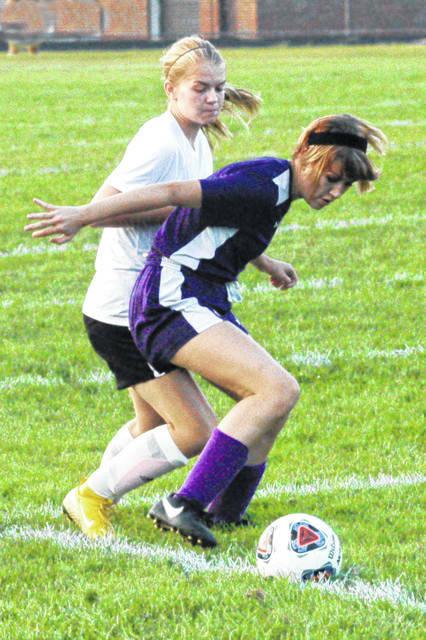 McClain High School hosted the Lynchburg-Clay boys and girls soccer teams on Tuesday in cross-county rivalry soccer matches. The Mustangs and Lady Mustangs won both matches with final scores of 3-0 and 12-0 respectively. The Tigers and Mustangs were the first to take the field on Tuesday and it was apparent from the opening kick that McClain was much improved from a year ago. Lynchburg was constantly on the attack in the first half but the back line of the McClain defense held tough for over 20 minutes before Mustang senior Chris Young netted a goal on a penalty kick. With a 1-0 lead the Mustangs continued to attack the Tigers’ defense without success and the match went to half time with the scores stuck at 1-0 in favor of the boys from Lynchburg. In the second half the Tigers continued to show that they were not going to go down without a fight as they managed to keep the aggressive and talented Mustangs out of the net for nearly 13 minutes. When Lynchburg broke through for the second time in the game it was senior Drew Pitzer that scored and gave the Mustangs a 2-0 lead. The Mustangs added a third goal with just under nine minutes to play as Mason Barrett scored off of a Kaden Harper assist and gave Lynchburg the final goal of the match and a 3-0 lead. The Tigers were able to get their own offense going but the defense of the Mustangs proved to much to crack. Even after beating the Lynchburg goalie the Tigers were denied late in the game as Nathan Brown made a spectacular kick save at the goal line to preserve the shutout for the Mustangs. Lynchburg-Clay Head Coach Jason West called it a “good win” for the Mustangs afterward and talked about the cross-county matchup. “Greenfield is a little bit bigger school than us. They are no slouch whatsoever and anytime there is a county rivalry it intensifies everything. It was a good win,” said Jason. In the girls game the Lady Mustangs cruised to a 12-0 victory over the Lady Tigers that included nine goals in the first half. Lynchburg’s girls were led by Peyton Scott who scored four goals in the first half and assisted on three other goals in the game. Kaylee Lunsford, Belle Brinkman, Raelynn Ruble, Sierra Benney, Riley Creditt and Paige Flowers also netted goals for the Lady Mustangs in the match. Lady Mustangs head coach Dennis West said that the team “played well” but there are things the team still needs to work on. “Their touches are all over the place so we wanted to work on that and work on our passing game in the second half and we got a chance to do that,” said Dennis. https://www.timesgazette.com/wp-content/uploads/sites/33/2018/08/web1_Jorden-Rose-and-Paige-Flowers-at-McClain-girls-soccer.jpgLynchburg-Clay’s Paige Flowers and McClain’s Jorden Rose battle for position and the ball along the sideline on Tuesday at McClain High School where the Lady Tigers hosted the Lady Mustangs. https://www.timesgazette.com/wp-content/uploads/sites/33/2018/08/web1_Braden-Bergstrom-and-Gavin-Frazier-at-McClain-Soccer.jpgMcClain’s Braden Bergstrom and Lynchburg-Clay’s Gavin Frazier battle for position in Tuesday at McClain High School where the Tigers hosted the Mustangs in cross-county soccer action.